Some circus types love training for the sheer physical thrill of it, while some train so they can have more tricks to perform, others see training as a way to challenge themselves. 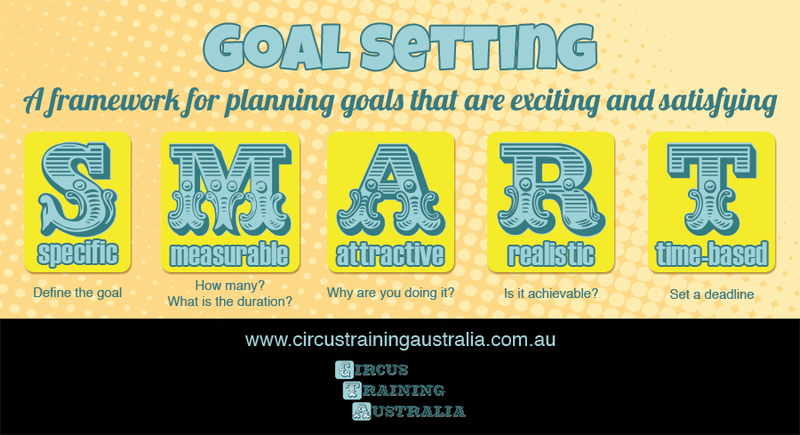 Regardless of the motivations, once your students have the circus bug, it’s definitely worth the time to set goals for their training. Without clear goals it can be easy to lose sight of why you are training in the first place. Goal setting can also be used to help acknowledge the progress and hard work that your students have achieved. But can goal setting be a bad thing? Most definitely! If the goals are poorly set or inappropriate, it’s not going to be satisfying. In fact a poorly set goal can have the opposite effect and serve to dishearten the student. Below is a simple framework that you can use to set appropriate and inspiring goals. In my descriptions below I’ve used tricks and skills as examples, but you could set goals based around an upcoming performance, or a project outcome. SPECIFIC – Make the goal distinctive so there is no ambiguity. Define the goal with detail. For instance, instead of having a goal of ‘doing a handstand’, spell it out to be either a ’spotted handstand’ or a ‘free-standing handstand with no help’ rather than any handstand. An ambiguous goal is unsatisfying to achieve, often because the criteria has been re-interpreted along the way. On the other hand, a specific goal gives the student clarity on what they are working on. MEASURABLE – The goal should be able to be measured, this gives the student feedback as to if it has been achieved. Using handstands as an example, you can add a duration to the goal such as a ’20 second handstand without the help of a spotter’. ATTRACTIVE – Make it exciting. If it’s not exciting, then at least make it relevant. Explain how the goal will benefit the student e.g. “If I can hold a 20 second free standing handstand, then my tumbling skills will be much easier to execute”. REALISTIC – Part of setting an inspiring and attractive goal is making it challenging. But it also needs to be within reach of the student, given the time frame and resources. If your student is just starting learning a cartwheel, then setting a goal of holding a 1 minute free standing handstand within a month may be a little over-ambitious, and when the goal isn’t reached can be a major let down. TIME-BASED – Set a deadline. This gives the student an element of hustle and a reason to be consistent in working towards the goal. Longer term goals can be difficult to focus on. Try to set goals that can be achieved within a 6 – 8 week timeframe. And lastly, why not set goals for yourself? You can set goals related to your own training or even your teaching; such as the number of students you teach, or how many students learn a new apparatus. I’d love to hear what goals you have already set, and what new ones you may be thinking about.